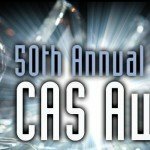 This is a reminder–the deadline for submissions for this year’s CAS AWARDS is Friday, November 15th, at 5pm! Please note that all of the information you will need for entry submission, and the rules of eligibility and promotion are all located online on our website. On the Awards tab, you will find a link to the fillable and downloadable Entry Submission Form PDF file. Please fill this out online, then print, sign, and return it either by fax or scan and email. If you have any questions, please email [email protected], or call the CAS Awards phone line at (818) 979-9000. Be sure to have your entries in to us by the November 15th deadline!